PURTAGERI: In Purtageri north Karnataka, Hindus are helping Muslims restore a mosque that was on the brink of collapse. It’s a century-old mosque that’s been crying for attention since last October. The roof of the mosque started leaking and a portion of it was badly damaged in the heavy rains that lashed many parts of north Karnataka last year. But with the rains setting in, a rare show of communal harmony was displayed to the entire country. 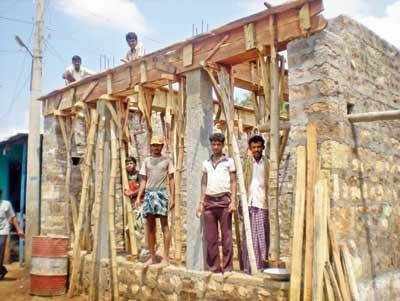 Hindus have taken the lead to pitch in with donations and construction material to re-build the damaged mosque in remote Purtageri, a village near Gadag in north Karnataka, about 400 kms from Bangalore. There are about 150 households in Purtageri of which only about 10 families are Muslim, who are daily wagers or agricultural labourers. Hence, they couldn’t afford the renovation of their only place of worship. But Hindus from the neighbouring historic town of Gajendraghada donated willingly and work is now on in full swing with donations to the tune of about Rs 1 lakh. Some Hindus who couldn’t donate in cash or kind, have volunteered to help with the masonry and labour.